A beautifully designed, purpose built ski resort Pra Loup is a well kept secret situated in the Southern Alps and is relatively unknown to British skiers. Everything is conveniently located and there is an excellent range of amenities providing everything you could want for on a ski holiday. 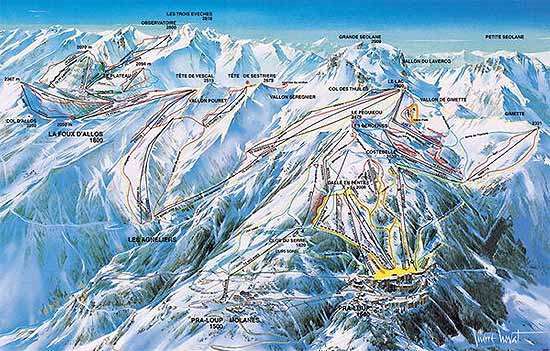 Pra Loup domain is divided into two levels: the lower part, "La Molanes" (1,500 m high), offers pistes for family skiing, while the upper part (1,600 m high) is more appropriate for experienced skiers. The lift system is very good and reliable natural snowfall is backed up by award winning snow making facilities which mean that Pra Loup offers great conditions long into the season. The Molanès chair lift will make your departure to go skiing easier, carrying you straight to an altitude of 1820 metres. A restaurant of altitude will allow you to have lunch or cup of coffee.